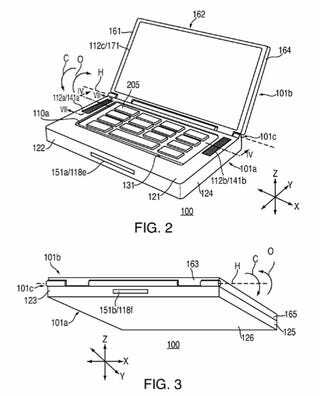 AppleInsider found four cooling-related patents by Apple that might be used in future MacBooks in order to better keep temperatures from getting absurd as performance increases. The most interesting is the one that uses USB/Firewire ports as vents. These ports would theoretically (while they're not being used, of course) help increase airflow to vital hot parts, so that you wouldn't have to create more vents on the other parts of the laptop. The downside is that if you're the kind of person who likes to plug everything in and fill up all the holes of your laptop all the time, you're cutting off potential ventilation. defines when an electrical current runs through the junction of two different metals. When electrons flow from a region of high density to a lower one, it allows them to cool. The application describes a "solid-state cooling mechanism" that would employ two sides to transfer heat away from the machine and help dissipate it.